The buyer of this Chivers Thresher 620 (the number meaning a hull length of 6.2 metres), a keen fisherman from Albany, had a clear idea of the boat he wanted – as locals tend to do with Antarctica next stop and poor weather always a chance. A feature he particularly liked the look of was the raised bow, though he also approved of the standard twin batteries. 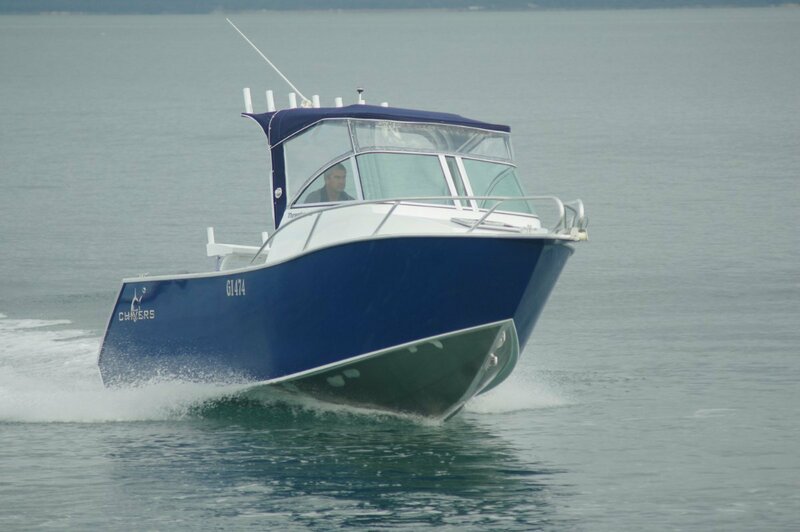 Primarily, of course, he wanted a steady fishing platform, and he also wanted a hull that would provide a decent and safe ride upwind and downwind. Not that many years ago, in aluminium you had a choice of good at rest or good under way; to have both was the Holy Grail. Then came designs incorporating broad reverse chines or water ballast allowing steeper deadrise, and the desirable became achievable. 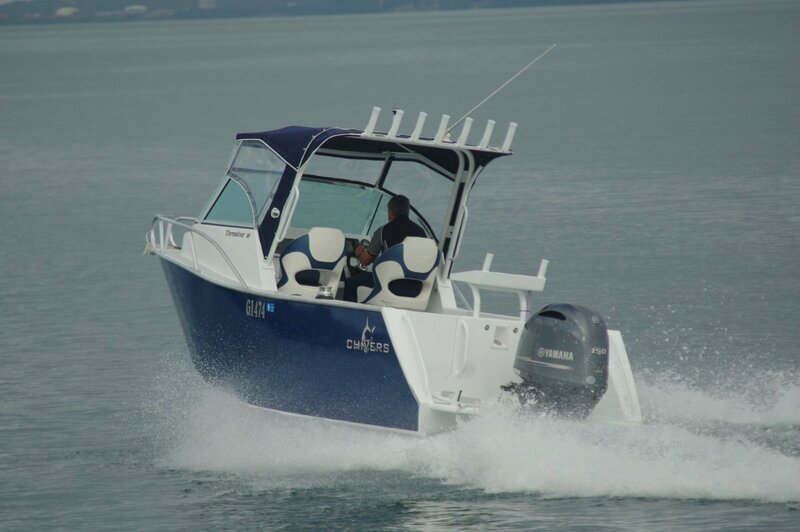 Chivers Shark series uses the water ballast system, the Thresher’s hull having a previously unthinkable 20 degree deadrise (larger hulls in the series have even more with a dual stage deadrise). 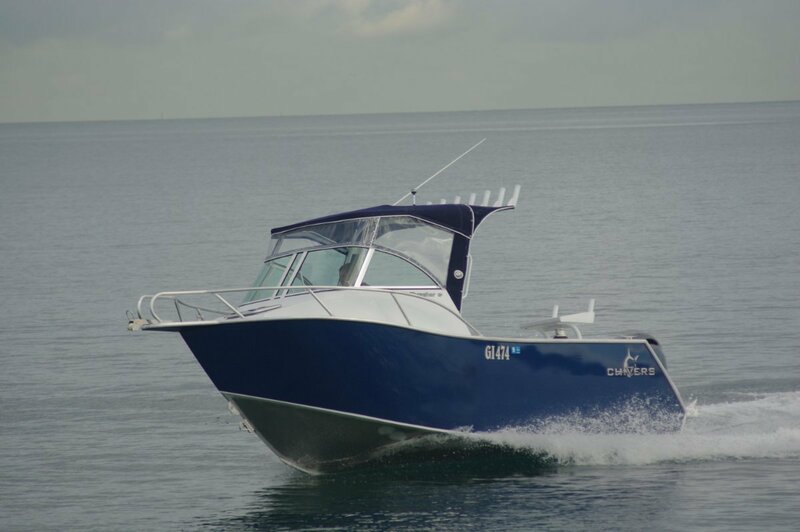 Ballasting for stationary work and de-ballasting for travel is automatic and practically instantaneous, especially with the acceleration provided by the 130hp Evinrude E-TEC. Chivers fitted a custom soft top that extends well aft and includes tabs for any added lights. With the incorporated clears it makes an exceptionally sheltered driving position. Two thumbscrews and two bolts are all that have to be removed to dismantle it. For long tows definitely remove the clears at least. The clears not only cause air drag with their frontal area; the cocoon they make with the soft top causes suction and extra drag. That suction could cause all kinds of debris to get hauled in. The driving position is the result of a string of minor refinements. Adjustable seat, footrest, wheel and throttle fall into the right relationship whatever the driver’s size. The electronics on this boat were transplanted from the owner’s previous boat (if you have what works why change it?) but Chivers fitted them in neatly. The driver’s and navigator’s seats are not only eye catching; they are as comfortable as they are good looking. 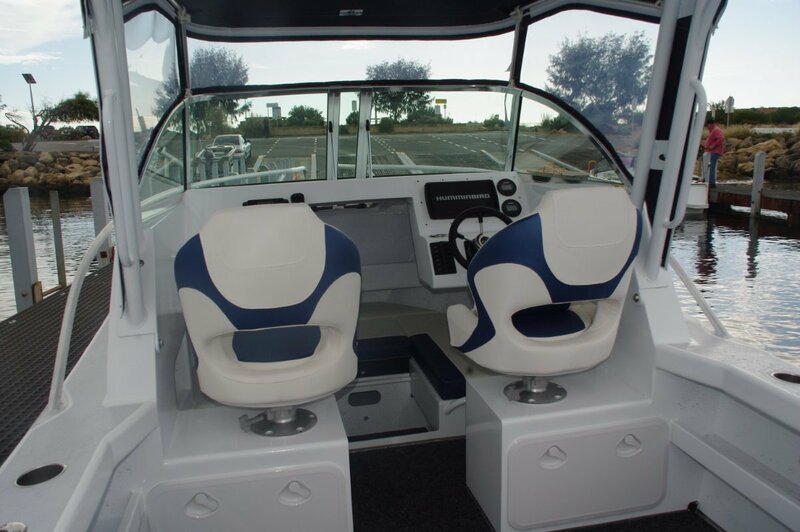 The other seating on board is a two person job at the transom. This is an upholstered box (more storage within it), set amidships to allow anglers access to the full length of the sides and the transom. The bait tray is set above the seat, and is removable to increase passenger comfort when not actually in use. The owner chose to have the increasingly popular pot winch fitted, and opted for the convenience of a foot switch. No pot tipper, though, instead relying on the simplicity of draping a piece of carpet over the side to protect the paintwork. As on all Chivers boats that paintwork does not extend to the gunwale – or anywhere else liable to abrasion, such as the anchor well edges. Storage gets plenty of attention. There are side pockets, bins under the settees, big lockers under the two principal seats and even a parcel shelf in the cabin’s forepart. Technically, probably, the catch tanks count as storage. These are a pair of 140 litre capacity self flooding and draining items. They sit within the lower hull’s cellular construction, as does the 180 litre fuel tank and the ballast chamber. All other cells are foam filled, providing positive buoyancy as well as sound deadening. A small but thoughtful instruction from the owner was for the positioning of the aftermost pair of rod sockets. Where most people are happy to have them raking aft he chose for the rake to be outboard: a far better set up, he feels, for a trolling rod. Behaviour under way was utterly predictable. In the mild prevailing conditions progress was essentially an armchair ride. With the motor in neutral the auto ballasting instantly dropped the chines below the water level. This delivered the stability of a broad beamed laden punt; simulated fishing activities involving plenty of people movement barely disturbed the equilibrium.